After two weeks of rather challenging vegetables, we decided to go with something we know and love. 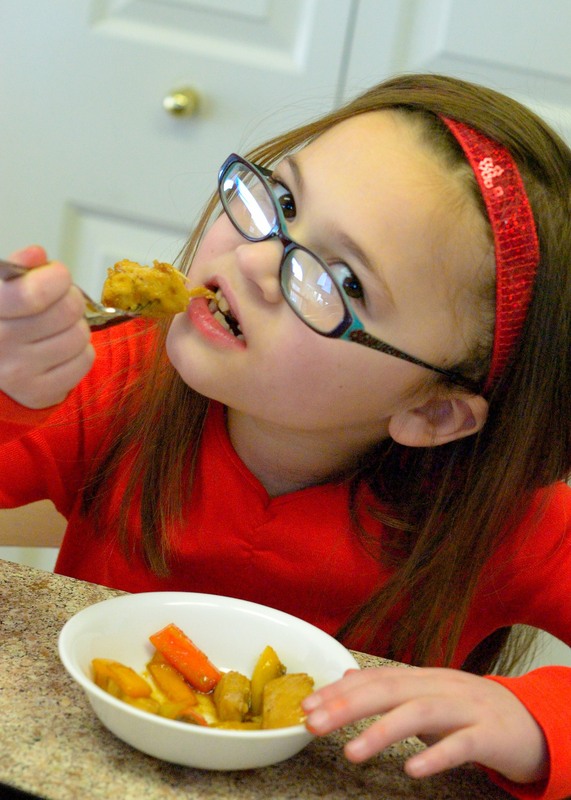 My kids love red, orange and yellow bell peppers. I keep a container of sliced bell pepper strips in the refrigerator for them to snack on. Sometimes they eat them plain, sometimes with salad dressing or hummus. We frequently eat them for lunch and pack them in lunch boxes. The kids think the orange ones taste the best. I think we should do a blind taste test to check that theory sometime. Anyway, we definitely have two thumbs up ratings from everyone in our family about raw bell peppers. So, this week we decided to try cooking with them. 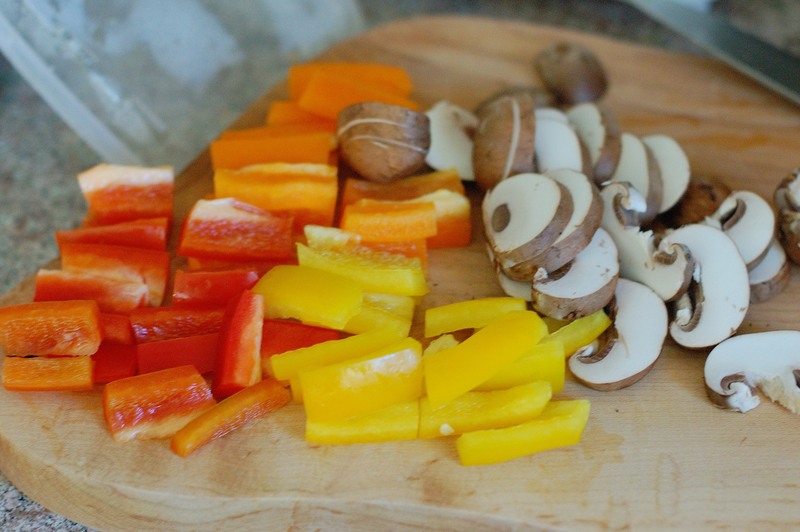 Since we all love bell peppers, I figured we could manage a dairy-free recipe to start the week, so that Theo could try it. No need to smother the peppers with cheese in order to make them tolerable! We chose stir-fried honey ginger chicken with peppers from marthastewart.com. I had the bell peppers already sliced and the chicken prepared. I decided to add baby portabello mushrooms to the recipe and I had those ready, too. I had ginger and garlic minced and waiting to add to the skillet. I felt so organized as I began to prepare this recipe. Then, my printer quit working, so I had to go back and forth from the kitchen to the computer to read the recipe. Then, I found out that I did not have the rice vinegar. 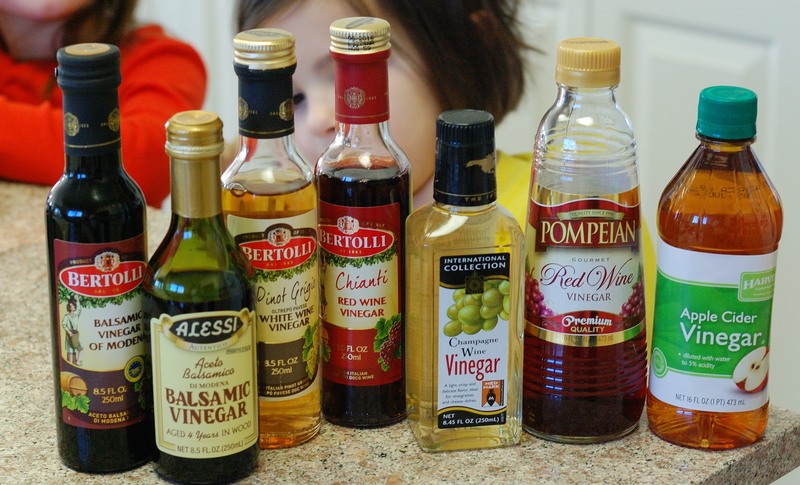 How can the right kind of vinegar not be in this ridiculous vinegar assortment? I went with the white wine vinegar. I chose the black rice. But, it didn’t exactly take 5 minutes to make. It took 35 minutes. So, the rice was ready long after the chicken and veggies. In the end, it all ended up cooked. It smelled great and the kids came running to the table. 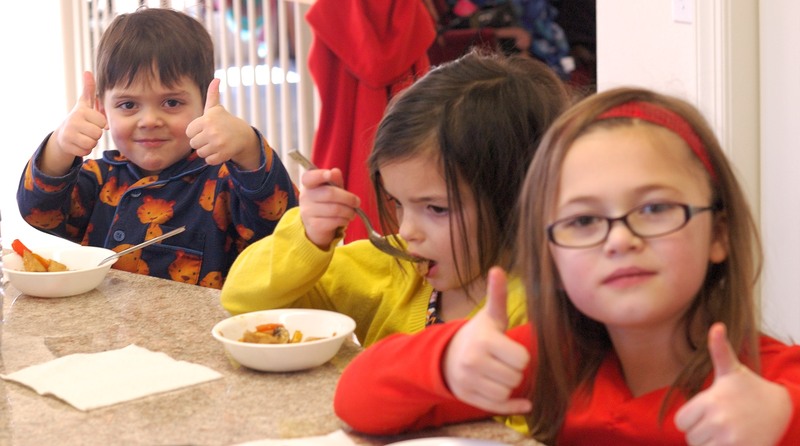 Upon seeing their lunch, some of my tasters were in a great mood. I really liked this dish. If I could make any changes, it would be to use less honey. I thought it was a bit on the sweet side. 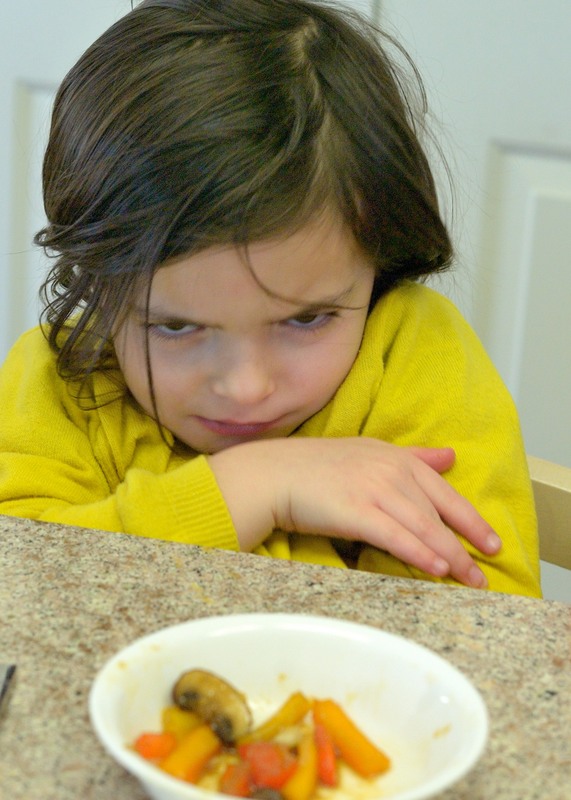 The kids all liked the chicken, but Josie did not like the cooked peppers or mushrooms. Theo and Lucie asked for seconds and thirds! We ended up without any leftovers. 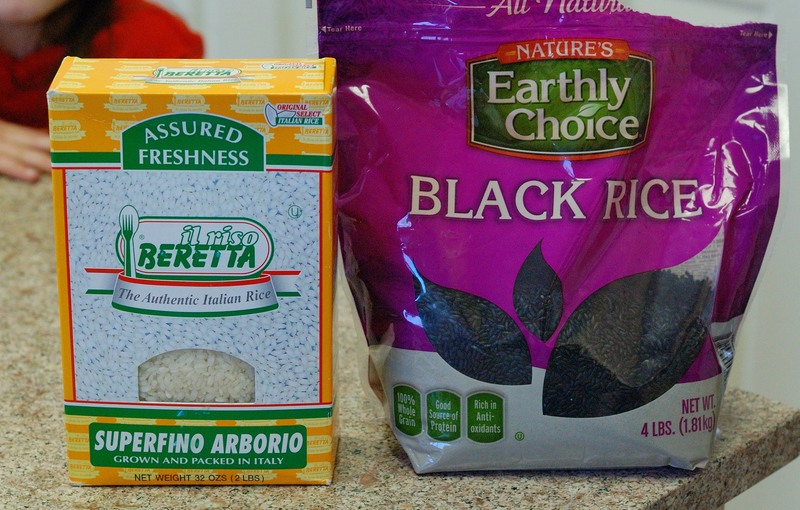 If you ever see the black rice in the grocery store, give it a try. It turns dark purple when you cook it and tastes pretty much like regular rice, but contains anthocyanins. Anthocyanins, which are also found in blueberries, eggplant and other red and purple fruits and vegetables, have antioxidant properties. Today we ate red, orange and yellow peppers. We tried a new recipe with them. I give it two thumbs up. This was my favorite recipe so far and I want to make it again. I am especially glad that Theo liked it. I think Josie would have liked it better if she was in a better mood. 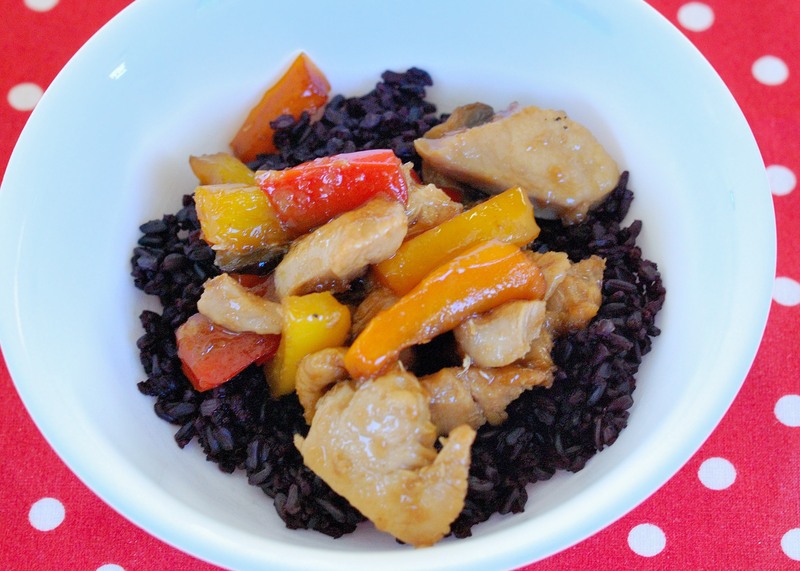 Categories: Bell Pepper | Tags: bell pepper, black rice, chicken, garlic, ginger, Martha Stewart, red bell pepper | Permalink.